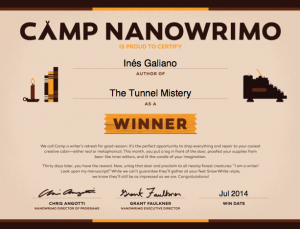 I published last month a post about the NANOWRIMO INITIATIVE titled Have you heard of NaNoWriMo ? that you can read here! -GOAL: Having a goal makes it easier. Quantity is not as important as quality, but it helps you calculate your improvements and encourages you to keep going. -DEADLINE: Having a deadline may seem harder, but it is actually a boost. Working under stress improves productivity! -JUST WRITE, DO NOT EDIT: Writing first, editing later. That is the MOST important thing that you learn from NaNoWriMo. Stop your inner editor, they will repeat each time. And it’s good advice. You won’t lose time editing. Afterwards, when you have a COMPLETE first draft, THEN you can edit your novel. After reaching your goal before the deadline (a month), they will sent you a congrats email, an electronic certificate and the access to the winner goodies (free stuff and discounts). In short, NaNoWriMo Camp is a great oportunity to GIVE YOUR NOVEL A PUSH while having fun and It is a training session for the actual NaNoWriMo (National Novel Writing Month), that will be held in November!